A Simple Jew: A Fire In The Shtetl? A Fire In The Shtetl? 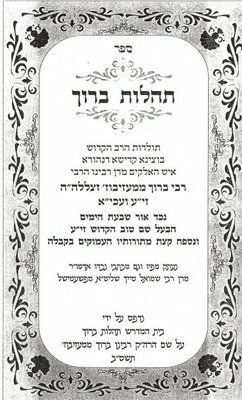 I bought a copy of Tehilos Baruch after my friend Avraham Nisan of MySefer.com informed me that this sefer mentioned Rebbe Baruch of Medzhebuz's curse of my family's shtetl. With Chabakuk Elisha's translation assistance, below is the reference from Perek Heh of this sefer. Our holy master [R' Baruch] and his holy brother of Sudilkov [the Degel Machaneh Ephraim] were close friends and they had great love for each other since childhood. Therefore he [R' Baruch] cursed the inhabitants of Sudilkov harshly for their lack of respect for his holy brother. We must know and understand that he was tzaddik whose level was as lofty as Atzilus and higher, and who worked on himself to reach his soul’s lofty level - to the point that he truly became a vehicle for it, so that this level was manifest in every part of him. He was a vessel through which the Shechina spoke, and was on the level of tzaddik who decrees and Hashem fulfills - and conversely, the tzaddik who when Hashem decrees, can nullify the decree. The holy master (R’ Baruch of Medzhebuz) aside from the rest of the qualities of his soul’s source, being a vehicle for the attribute of complete kingship, he himself was a king in his own right in all his ways. And as such, anyone who opened his mouth against him was tantamount to a morid bemalchus (one who rebels against a king), and thus, is deserving of death. Therefore his [R' Baruch's] curse that he placed on the town of Sudilkov for their sins would have wiped them all out, if not for the sweetening of the decree by other tzaddikim, and therefore only a portion of the homes there were destroyed by fire. If not for that, the entire city would have been destroyed. Interestingly, I mentioned this story to the Sudilkover Rebbe in a recent converation and he said the he did not believe that it was true. He further questioned how a tzaddik could curse a shtetl with inocent men, women and children to be destroyed by fire for the sole purpose of defending a person's honor. Since there are no footnotes relating to this in Tehilos Baruch, I would be curious to know what the source of this story is. ASJ: Firstly, I would suggest trying to contact the Pshemesheler Rebbe (Rabbi Shmuel Teich), who appears to be responsible for this sefer. how a tzaddik could curse a shtetl with inocent men, women and children to be destroyed by fire for the sole purpose of defending a person's honor. While I hear the difficulty, isn't that something similar to what happened to the town of Shechem when Yaakov Avinu's daughter Dina was violated? Yaakov Avinu never said they [Shimon & Levi] were wrong, just that he had brought them other problems [in our lingo, we'd say they weren't politically correct!]. See also the Ramban there as to why the entire town was punished. It is also told that the Rebbe Reb Baruch was upset with the Baal HaTanya [Rebbe Schneur Zalman of Liadi, founder of Chabad], and that a fire broke out where some of his handwritten works were, and we thus lost major parts of the "Shulchan Aruch HaRav". We have most, or perhaps all, of Orach Chaim; but only fragments of Yoreh Deah and Choshen Mishpat, and none of Even HaEzer, even though his sefer covered all of Shulchan Aruch! The Gemara also speaks of certain Tannaim who were makpid on each other, and when one succeeded in saying Tachanun [he was usually distracted from doing so by his family members] his colleague - the one he was makpid on - died! PS - I was told by some people who were there, that when Reb Shlomo and his brother Reb Elya Chaim Carlebach changed the Nusach of their father's shul from Ashkenaz to Sefard, a fire broke out somewhere in the Shul! Yitz: I have tried to contact R' Teich. Someone who once knew him told me that he too wasn't able to locate him recently. As for your examples. I tend to agree. I immediately thought of the story of Rabbi Shimon Bar Yochai when he first left the cave. Yes, you're right about the Rashbi. Of course, he was sent back into the cave for that! I've been to that cave, it's in the town of Peki'in in the Upper Galil, not too far from Tzfas. Baruch Hashem there were other Tzaddikim who were able to mitigate the wrath of the Rebbe Reb Baruch! Yitz: Wow, I never realized they knew the location of the cave. I also wish I knew who the identity of "other tzaddikim" who were mentioned in the story. It is surprising to me that the Sudilkover didn't believe the story! The hakpodas of Tzaddikim that create dinim lemayla are not unheard of. When middas hadin are awakened, sad events take place - may we never know of such things. It's of interest to note that a chossid, upon commenting over the m'chlokes between the Ba'al Hatanya and R' Boruch, was told that it was a m'chlokes that dated back to the times of Dovid and Shaol . . .
Chabakuk Elisha: When I spoke with the Sudilkover Rebbe he mentioned that the website (http://www.eton.co.il/) contained an article by him which further explains his position on this general concept. I have not yet located it, but will let you know when I find it. Mottel: Thank you for sharing that. > was a m'chlokes that dated back to the times of Dovid and Shaol . . . It is mentioned in Likutey Moharan 283, and there such kind of machloykes is explained. In reference to this story about R' Baruch, the Sudilkover Rebbe responded that even if the story was true, it still didn't need to be printed. That's common. Many mayses are private, and guarded. But we still want to see them anyway :), but we should be careful with such stuff. Do you think this story should have been printed? If not, why not? Hard to tell. 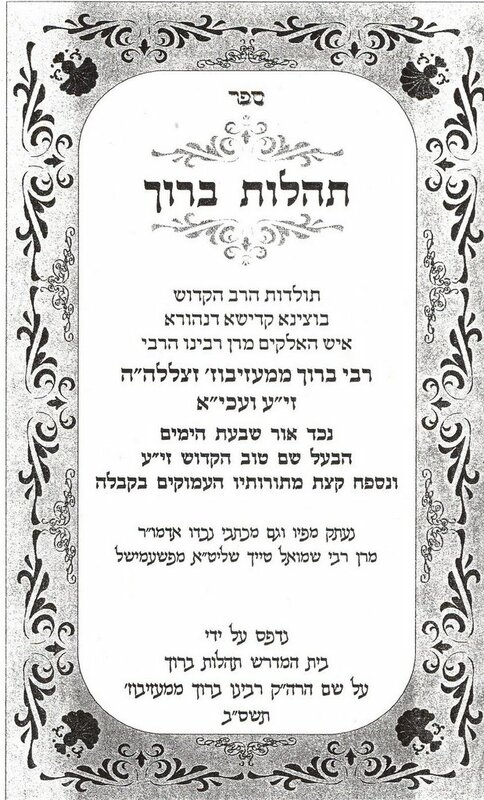 I've heared for example, that Reb Motl Zilber (Roysh Chaburo deStuchin) has a whole collection of mayses from the old Amshinover Rebe ztz"l (many of which are VERY unusual) and he is against publishing them, however his talmidim anyway try to get hold on them. There was a story with Baal haTaniya once. He used to write some of his maymorim, and didn't show them to anyone. Some of his chasidim secretly used to sneak in his study and copy them. Once Baal haTaniya said, that the one who will do it will pay with his life. He wrote some maymorim, and fire broke out and they were lost. He asked his chasidim if anyone made a copy? They said that they didn't want to play with death. "And where was your mesirus nefesh for Toyro?" exclaimed Baal haTaniya. A Yid: Thank you for your comment.